Alzheimer’s neuroimaging study notes deterioration in communication pathways for women at risk. In their latest neuroimaging study on women at risk for Alzheimer’s disease, York University researchers have found deterioration in the pathways that serve to communicate signals between different brain regions needed for performing everyday activities such as driving a car or using a computer. The opensource study is published in the Journal of Alzheimer’s Disease. The team state that typically, Alzheimer’s disease is associated with memory loss, perception and other aspects of cognition, while debility in complex movements is observed at a much later stage, adding that the findings also suggest that their computerized, easily-administered task that the study participants performed, can be used to test those at risk for Alzheimer’s disease to flag early warning signs to indicate the need for neuroimaging and blood tests. The current study was conducted on 30 female participants of whom 10 were in their mid-20s. The rest were in their 50s or older, with half of them at high risk for Alzheimer’s disease. The team state that they decided to focus the study on women as there is higher prevalence in this group, and also women who carry the ApoE4 gene are more vulnerable to the degradation of white matter. This genetic risk factor for Alzheimer’s disease was also one of the traits tested. The researchers scanned the brains of the participants, aiming to see if the impaired cognitive-motor performance in the high risk group was related to brain alterations over and above standard aging changes. The team observed a relationship between the levels of deterioration in the brain wiring and their performance on set tasks that required simultaneous thinking and moving; what was noted is a result of communication failure. According to the data findings the big question ahead is what can be done to prevent a decline in function of a person’s brain showing neuroimaging diagnostic signs of communication problems. The answer the team is exploring is finding ways to use these thinking and moving tasks in a proactive way, as part of a game-like cognitive-motor integration training method mapping any changes with their tried and tested neuroimaging technique. Left panel: Signiﬁcant voxelwise between group tract-based spatial statistics (TBSS) results demonstrating (A) lower fractional anisotropy (FA), (B) higher radial diffusivity (DR), and (C) lower axial diffusivity (DA) in both low AD risk (blue-light blue) and high AD risk (red-yellow) older adults relative to young adults. Thickened thresholded p-values (tbss ﬁll) are overlaid on the group mean FA skeleton and displayed on a standard MNI152 brain. Tracts are labeled using the JHU white matter atlas. Right panel: Scatterplots of signiﬁcant correlations between diffusivity measures [(A) FA, (B) DR, (C) DA] and cognitive-motor performance scores. Correlation statistics are listed in Table 3. R, right; L, left; FMi, forceps minor; CC, corpus callosum; IFOF, inferior fronto-occipital fasciculus; ILF, inferior longitudinal fasciculus; SLF, superior longitudinal fasciculus; FMa, forceps major; hCG, cingulum (hippocampal region); CST, corticospinal tract; M1, primary motor cortex; IPL, inferior parietal lobule. 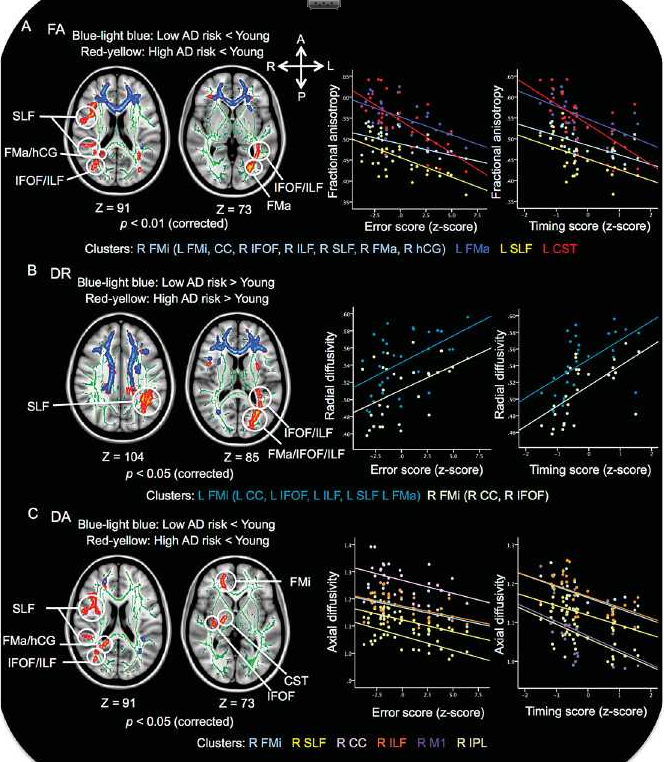 Diffusion Tensor Imaging Correlates of Cognitive-Motor Decline in Normal Aging and Increased Alzheimer’s Disease Risk. Hawkins et al 2015.